This feature allows to run other applications fast and easy. 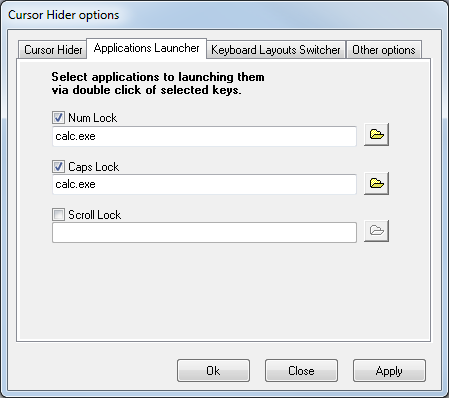 Simply press selected key twice (similar mouse button double click) to start an application. User may setup 3 applications. Cursor Hider uses Num Lock, Caps Lock and Scroll Lock keys for this feature because these keys return to the initial state after double keystrokes. Options- Applications Launcher. Activated Num Lock and Caps Lock keys. By double keystrokes calculator will started. Cursor Hider is programmed to use the one instance of the called software. So if you ran Calculator earlier and then want run it again Cursor Hider will try to use already the working Calculator instead starting a new instance.